A gripping thriller from start to finish. 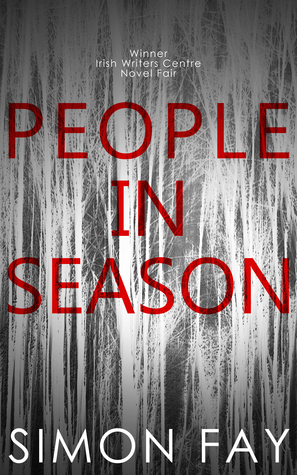 People in Season was a darker story than I normally read but I really enjoyed it. Agent Mullen is tasked with finding the 'untouched' before they can harm other people. Agent Mullen is referred to as a 'Social Agent' basically a government bureaucrat sent out into workplaces such as a newsroom to find Untouched People, he does this by interviewing and watching everyone some people might say it's a boring job but I found the idea interesting especially if you like studying human behaviour, how people interact with each other and how they act themselves in given situations. Taking into account for this story that most of these people are reporters makes it even more interesting as these people are usually the ones doing the interviewing but here in this case they are also being interviewed. With the basis of the storyline being set in the future the whole book has a slight science fiction quality about it but without it seeming unbelievable. The author Simon Fay has a unique way with words, so much so you can actually feel the tension coming off the pages as he describes certain scenes, this is what makes the book so hard to put down, it's also what makes the game played throughout the story much more thrilling and where the hunter becomes the hunted or do they? I love how the story is played out to the very end. and still leaves you wondering if they got it right or not. This thriller was just that and so much more, it was beyond any other thriller I have read, the characters love playing games with each other, which in a crime thriller makes the story even more gripping because you never know which way the game is going to play out and because a game can have many twists and turns plus you don't know the winner until the very end you just are never sure if the crime will ever be solved, will the perpetrator be apprehended or will the bad guy win this one. I really enjoy the mind games that come with a well written thriller and Simon Fay does not disappoint. Agent Francis Mullen is used to investigations where he is made to feel unwanted, it comes with the job and he really loves his job, it's all about being able to really read people, to find out just what makes them tick. Francis meets reporter Ava at the newsroom and he is instantly taken with her but he is confused as to why, is it just an attraction or is it more and what game is she really playing, if any at all. I love the way Francis comes off as being a bit nervous when interviewing people, it is an interesting tactic and one that works for people to underestimate him, not only is Francis very good at his job he has made it his life's work to understand human behaviour especially that of the 'untouched'. The ending to this great story will leave you breathless.